Yes, we must continue the debate about improving DISD schools, but the public must first have all the information needed to engage in the debate. An open records request will be made, within the month hopefully, that is now being circulated among organizations to secure their support for demanding this information in this format. The request is for 10 spreadsheets covering the current year and the past 9 years of DISD budget expenditures by school. 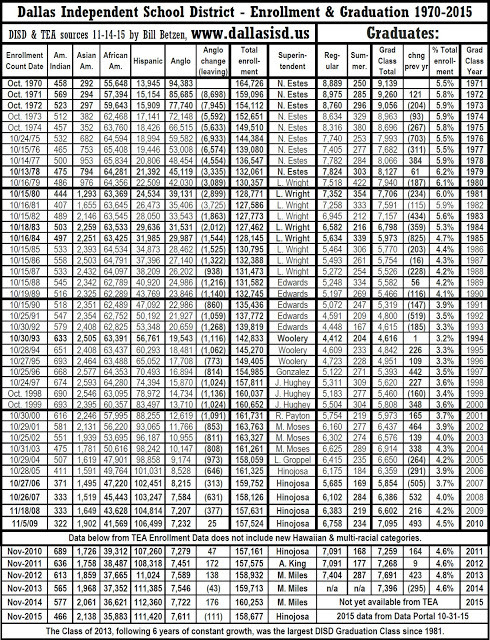 Each spreadsheet will have one row for each of the 228+ schools and one column for each of 70 variables per schools, possibly more. The next 32 columns will be the full cost allocation per student at each school as reflected in the last column of the PEIMS Standard FInancial Reports files on the TEA website. These spreadsheets will allow the public to see exactly how money is allocated by school, and to see the history of those allocations. This level of transparency will allow the debate about improving DISD schools to have new life and accuracy. This change to a school grounded in family history, and more fully goal-focused students and parents, will cost taxpayers almost nothing! Not having such goal-focused students and parents costs taxpayers millions per school! Dallas Morning News ignores record annual enrollment losses in DISD History. The recent article titled "Dallas ISD predicted to lose 5,000 students in next 10 years, demographer tells trustees" makes a major error in the statement: "a 5,000-student downturn that would be unprecedented for DISD." Sadly there one year in DISD History when the district lost over 9,000 students in just one year! During the explosion of White Flight in DISD the loss was over 5,000 White students for each of five different years from 1969 to 1977. This is well documented in both DISD records and in newspaper articles at the time. The data is collected at http://billbetzen.blogspot.com/…/dallas-white-flight-dates-… . The record all time high DISD enrollment was in 1969/70 of 173,799 students. DISD Administration was optimistic, totally out of touch with the Dallas community, and projected continued record growth and of 180,000 the next year. That did not happen! The enrollment for 1970-1971 dropped by 9,073 students to only 164,726! The Dallas ISD enrollment loss from 1969/70 to 1970/71 is the greatest single year of total enrollment loss in DISD History! It could be called the year White Flight exploded. By 1977 total DISD enrollment had fallen to 139,090! The 1964/65 school year had the highest White enrollment on record for DISD, 127,124. Within 12 years, by 1977, White enrollment had dropped by 74,116 students (58%) to only 53,008. Hopefully Dallas ISD will never come close to another 5,000 student loss in only one year again. The last of the five 5,000+ student losses was the 1976/77 school year. Sadly DISD enrollment losses of usually thousands a year continued until 1984 when enrollment fell to the lowest level in the past 60 years of only 127,462 students. Then a slow climb began as more minority students joined DISD than were lost in the White Flight that continued until 2010. Townview Science & Engineering Magnet is Dallas ISD's best! 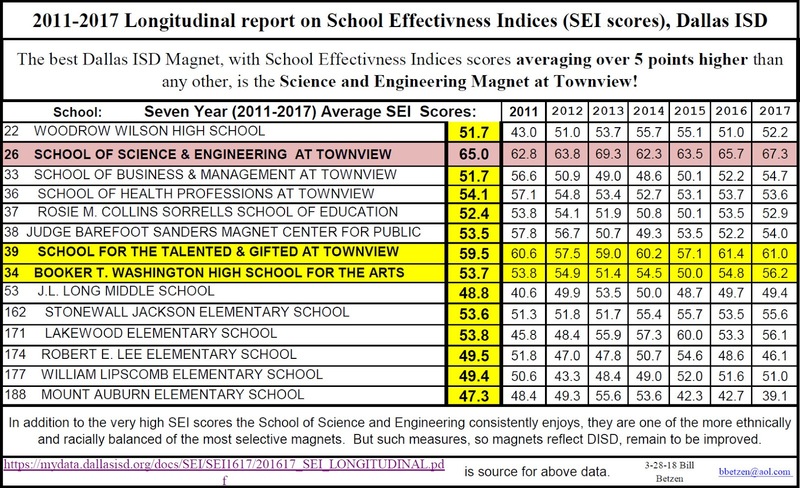 This 7-year report on School Effectiveness Indices (SEI) scores shows what a consistently and unusually high performing treasure the Townview Sciences and Engineering Magnet (SEM) is. It performs better than any school in all of DISD! And it is on the Southside of town at Townview. We need more students to apply from the Southside of Dallas to attend so that the 22% Black student enrollment for DISD is reflected and the 70% Hispanic DISD enrollment is better reflected. We also need more girls to apply to attend. It is a priceless treasure! It is relatively ethnically balanced* especially compared to Booker T Washington where the SEI averages 11.3 points less than SEM. While SEM needs demographic changes to better represent DISD students, it is already better matching DISD demographically than other magnet schools. See demographics below. *SEM Student demographics as of 03/30/18: WHITE = 13.8%, AFRICAN AMERICAN = 10.1%, HISPANIC = 59.5%, AMERICAN INDIAN = 0.7%, ASIAN = 14.1%, MULTI-RACE = 1.9%. A total of 59% of SEM students are from Economically Disadvantaged homes while 86% of all DISD students are Economically Disadvantaged. 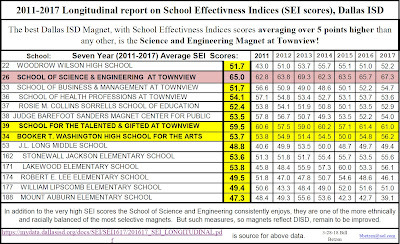 We must not ignore the fact that the Science and Engineering Magnet, with the highest average SEI score in DISD, averages over 5 points higher in their SEI score than all the other best schools, year after year, for the past 7 years! The "worst" year for SEM was 2014 when TAG came within 2.1 SEI points of matching the higher SEM score. 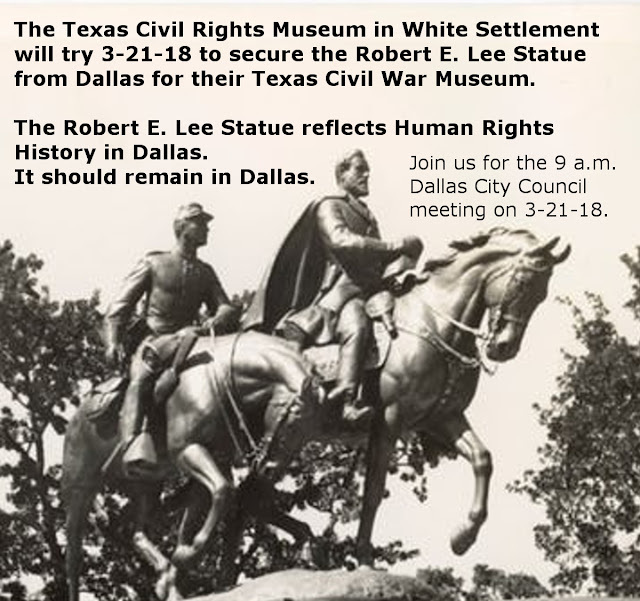 Today in the Dallas Morning News there was a misnamed front page article titled "Dallas May Send Lee Statue to FW." The Texas Civil War Museum is located in White Settlement, not in Fort Worth. The address is 760 Jim Wright Fwy, White Settlement, TX 76108. In at least one online location it is listed in Fort Worth which is an error. Regarding history, this town of White Settlement was originally named due to having "White" settlers to separate it from the Native American settlement closer to where downtown Fort Worth is currently located. In 2005 they voted to change the name but over 90% of voters were against such a change. Re: "Why does DISD resist data for improvement? Trustee Dustin Marshall says too many are only interested in protecting the status quo," Sunday Points. Solid data, well-defined and accurate, must drive Dallas ISD decision-making. Marshall is right. Sadly, he fails to mention transparency. Instead he attacks the two trustees working hardest for transparency. He states: "If you look at the number of items that are pulled off the consent agenda at our DISD board meetings, 99.9 percent are pulled by two people. And, if you look at the amount of time spent speaking at our board meetings, it's 90-plus percent those same two people." I attend most DISD monthly board meetings. I have listened for hours to questions by Joyce Foreman and Bernadette Nutall about the items they pulled. There is a pattern to the questions these heroic trustees ask. Most often their concerns are poorly documented expenditures. Most concerns would disappear if DISD trustees and staff were to better document items in the DISD board meeting agendas. This would benefit everyone in Dallas. It would provide a more complete written record. If Marshall agrees, he should demand better-documented agenda items. He should join Nutall and Foreman in their battle. Better agenda documentation and transparency would provide shorter board meetings!. Everyone wins!